With the weekend already on the very near horizon, there are some pretty big Airsoft OPs going on around the country and I thought it might be prudent to provide some of my suggestions on what to bring with you to a major event where you'll be camping out all weekend. Some of the obvious choices would be your guns, of course. That's the most exciting stuff to pack. But it's important to take more than just your guns. There's nothing worse than paying a bunch of money to travel out of town for an Airsoft event, pay the large registration fee (if you're attending a Lion Claws event) only to get there and realize you've forgotten something very important and nobody else has the item you're in need of. So first and foremost, I ALWAYS recommend writing out a checklist, or typing one out on your computer, phone or tablet device. Whatever works for you. Just make a checklist and make it thorough. Don't check things off the list until you've actually packed them in a bag and loaded them into the vehicle. - 1 Primary Rifle (Usually it's a Designated Marksman Rifle (DMR) or machine gun for me). - Optic - appropriate for whatever platform I'm running. Leapers scope for DMR or Elcan Optic for support weapon. - Plenty of magazines for DMR/Assault, or Box mag for support weapons. - BBs for Primary (<5,000 for DMR, 20,000-30,000 for machine gun). I know that sounds like a lot, but the more bad guys on the other side, the more BBs you'll need to hose them down all weekend. It is especially important to bring the best BBs you can get with you to big games because you've got a lot invested into the weekend and therefore you'll want to maximize the amount of fun you have. Using poor quality BBs can lead to a lot of missed targets, which is lame. I prefer the new line of Elite Force BBs. 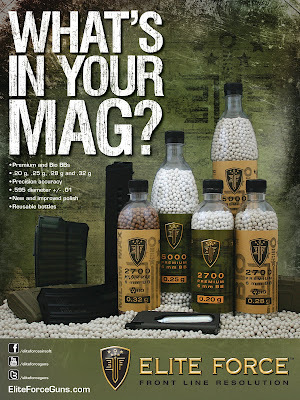 Now that they've got the .32g MilSim Max Bio BBs, they've pretty much got options for just about any platform out there. I know that there's a small niche of guys that run heavier BBs than that for their sniper rifles and PolarStar guns, but they're a select few. Pyramyd Air does carry several options in weights heavier than .32g which will do just fine, so you're not completely SOL if you fit into this niche. - Battery Packs (PLURAL) and Charger. Since there is not usually a power source provided at most outdoor fields, I usually bring a 400w Power Inverter that plugs into my car's cigarette lighter, which gives me two outlets, a usb port (for charging cell phones & tablets), plus all the power I need to run all three if necessary. The higher quality chargers will often come with a set of connectors to run your charger directly off of your car's battery, but you really need to know what you're doing to avoid serious injury, damage to your stuff and the potentional to be stranded out in the middle of nowhere with a dead car battery afterwards. For this reason, if you're going to do this, I recommend a set up jumper cables, which you should carry in your car at all times anyway. - Sidearm, plus 2-3 extra mags. 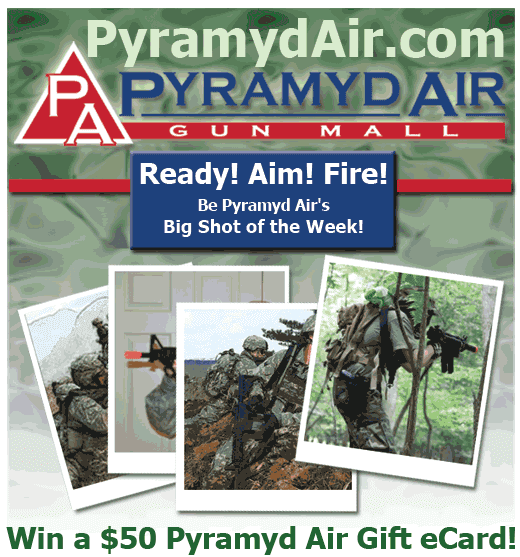 - Can of green gas or propane for sidearm or any GBBRs that you may have brought with you. I'd recommend at least two cans of gas if you run a GBBR and plan to play with it all weekend. You can get by without any fancy tactical gear and such, but you won't be able to play without your Eye Pro, so don't leave home without it. Never a bad idea to always keep a backup set stored in your gear bag in case you take your primary set out for some reason and then forget to put it back in the bag when you go out to your next event. - For big weekend OPs, I try to stay as lightweight as possible these days to preserve precious energy. I can't say I've been able to stay as active as I'd like, so going out and hard-charging at full speed for the entire weekend with a ton of gear on just isn't realistic. So I like the high-speed plate carriers or chest rigs out there that are smaller and lighter weight than a traditional, full-size CIRAS-style plate carrier. Voodoo Tactical has several new lightweight options in both the plate carrier and chest rig department that are a new balance between high quality and affordability. - Some of my buddies have even moved to just running a battle belt rig, no vest at all. This is even better for lightening your load, but depending on how long you have to be out in the field and the type of weapon setup you have, this might not be enough for you. "What is the probability that I am going to need this item while I'm out on the field?" If it's a low probability, keep it with your stuff in the parking lot or staging area. - A good set of boots or high-quality hiking shoes are advisable when dealing with any sort of rugged terrain. The longer you're going to be on your feet, the more important it is to have good foot support to protect not only against sprained/broken ankles, but from slipping on slippery surfaces and also to prevent fatigue on your knees, hips, feet, back, etc. that would otherwise occur from having poor foot support. You would be surprised how much damage you can do to yourself from wearing bad shoes for a prolonged period of time. 5.11 Tactical makes a great line of tactical footwear and is what I've been wearing for years now. - I always like to have a pair of gloves. Whether they're the ultra-trendy Oakley hard-knuckle gloves or just a second skin set, it's nice to have gloves. - If you're going to be playing at some sort of abandoned structural facility, I generally advise wearing a tactical helmet. Not only do you look much more tactical hot, but it will actually provide cranial protection should the situation arise where you're not paying attention where you're going for whatever reason and happen to run into a low-hanging board with a rusty nail sticking out or with a sharp edge. I've hit my head numerous times while clearing rooms of run-down buildings, but never once got injured because I was wearing that helmet. I recommend helmets to anyone, regardless of height, not just for tall guys. Well, that's not all I would take with me, but for the purposes to cutting myself off before this thing gets any more long-winded, I will leave it at that for now. I'll pick up where I left off in another blog this week with some more tips in other areas (food & water. I didn't forget, that's just a whole other topic) that I think are either crucial to a successful Airsoft weekend, or will improve your quality of life drastically. If you've found this post to be helpful in any way, please share a link to it with your homies on your favorite forum or social network. Please feel free to add your suggestions on good guns & gear to bring on an all-weekend Airsoft trip in the comments below.